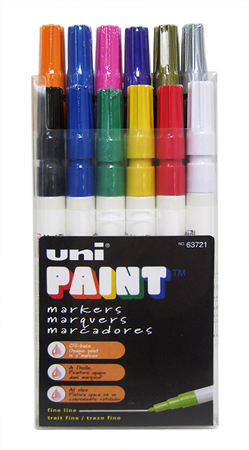 When you are looking for more colors for your displays, check out this 12 pack of Uni Paint Markers. These quality paint marker selections come in 12 bold, weather-resistant, fade-proof colors. The pointed tip is approximately 1/16" in diameter. You can pick up an individual pack of these Sanford Markers or choose multiples for your needs.